CANBERRA, Australia, January 7, 2013 (ENS) – Days of bushfires have left parts of Australia’s island state, Tasmania, in ruins, and now the rest of the country is bracing for what forecasters say is the worst fire danger in decades. The heatwave covers a huge region, from northern Victoria and inland New South Wales, to central west Queensland, across to north-western Western Australia and south to the Nullarbor coast. “It’s just an extensive dome of heat over the continent,” warned Dr. Karl Braganza, manager of climate monitoring at the Australian Bureau of Meteorology. In southeast and east Tasmania and across the Tasman Peninsula, ongoing bushfires that started January 3 have wrecked homes, closed roads and dropped power lines. 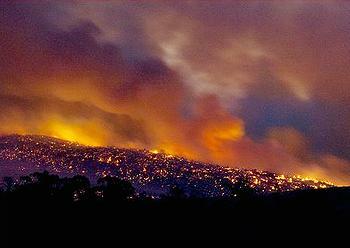 The charred Tasman Peninsula again faced disaster last night as a bushfire burned through state forests. Parts of several national parks on Tasmania have been closed as firefighters battle numerous blazes. The federal and state governments are offering emergency financial help for Tasmanians who have lost their homes to the flames. Now a “catastrophic” fire warning has been issued across Australia ahead of temperatures set to soar above 40 degrees Celsius (104 degrees Fahrenheit), driven by an extremely hot air mass. The state of Victoria has been placed on high alert with the mercury topping 40 degrees in the north of the state. Temperatures are expected to peak in the mid-40s in the cities of Adelaide and Melbourne and inland locations such as Alice Springs all face temperature forecasts of 40 degrees or higher. 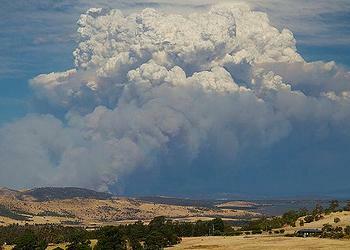 “We know that there are around 80 fires burning in New South Wales now. Eleven of them are not within control lines,” Gillard said. “Another concern is the amount of vegetation following two wet years, which has led to high fuel loads, that continue to dry out and raise concerns about increased bushfire risk. Fast moving grassfires are of particular concern,” said Hainsworth. Increasing fire danger is anticipated in southeast Australia with hot and gusty northerly winds. The Bureau is providing advice through federal and state emergency services partnerships to help them prepare for the onset of this heatwave and its likely impacts. “The next week is set to be a scorcher so it’s crucial Australians are prepared in the event disaster strikes,” said Attorney-General and Minister for Emergency Management Nicola Roxon. “While disasters can be unpredictable, we can all be better prepared. Conditions are hot and dry with an increased risk of bushfires in many areas of the country so it’s crucial that people are aware of fire bans and warnings in their local area,” she said. A total statewide fire ban was imposed last night across New South Wales. National Parks and camping grounds will be closed and nursing homes and vulnerable people in vulnerable areas will be evacuated. Firefighters across Sydney, the Blue Mountains, Newcastle, Wollongong and the Central Coast are preparing to respond to any bushfire emergencies near urban areas and will also respond to calls from the NSW Rural Fire Service. “Tomorrow, we are expecting extremely dangerous bushfire conditions, the likes of which haven’t been seen in NSW for many years. It is 19 years to the day that we saw more than 100 homes destroyed in southern and northern Sydney,” said Mullins. Commissioner Mullins urged residents in urban-bushland interface areas to heed warnings from the Rural Fire Service and ensure their homes were well prepared against the threat of bushfires. People are warned not to operate electrical machinery near grass and to refrain from riding motorbikes in grassy areas. “I encourage everyone to visit the RFS website, download a bushfire survival plan and complete it today, so that if a bushfire does impact your property, you and, more importantly, your family know exactly what to do,” Mullins said. Grassfires are already taking their toll on firefighters. 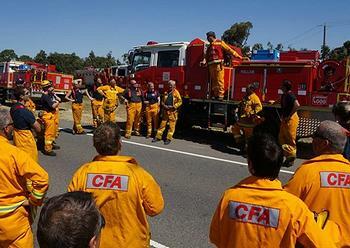 A male volunteer firefighter from the NSW Rural Fire Service sustained severe burns to his hands and face while fighting a grass fire at Gundaroo, south-east of Yass this afternoon. He has been airlifted to hospital for treatment.